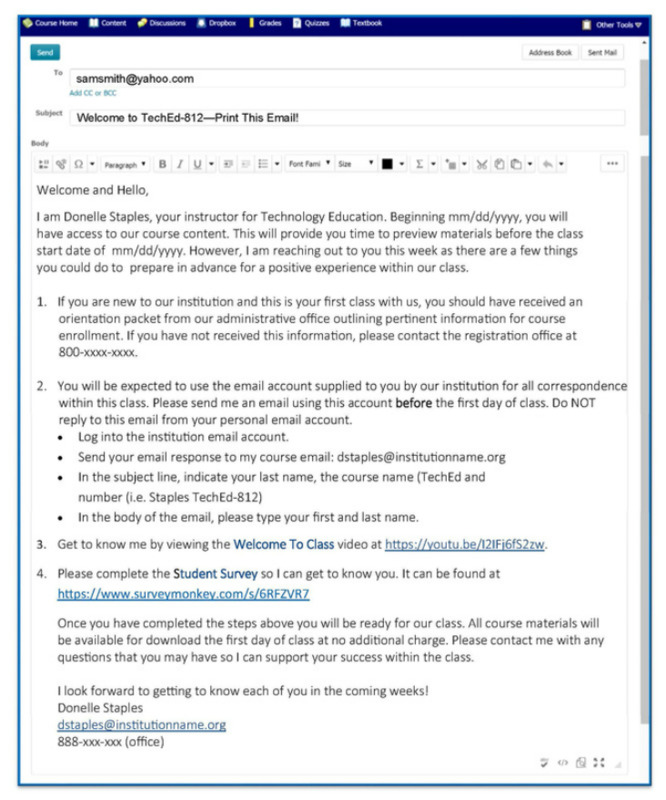 The pre-course email is the first communication by the instructor to the students. This communication must include pertinent information for the student to begin class with a positive impression. Providing information in a sussinct manner with a welcoming tone can support a positive first impression while providing steps for success to the student. Within my pre-course email, I have included basic administrative activities to be completed by the student to ensure communication access is established before the first day. ​bi-directional exchange for understanding a little more about one another. A YouTube video offers an avenue to share my philosophies of teaching and learning with students. A student survey offers an avenue for students to share basic information about their familiarity with online classes, their learning preferences, as well as some of the challenges they have experienced in the past. As questions are posed purposefully, I can better understand individual learning preferences of students to assist in creating collaborative groups within future assignments.